Sometimes I write articles for other venues and they don't turn out like I want them to. Case in point, this climbing gear guide for Outside Online. You'd never know how much work I put into that thing by the '10 words and a stock photo' turnout. I set up several photo shoots and wrote, well, at least twice the words. Anyway, I've got more, so here it is. 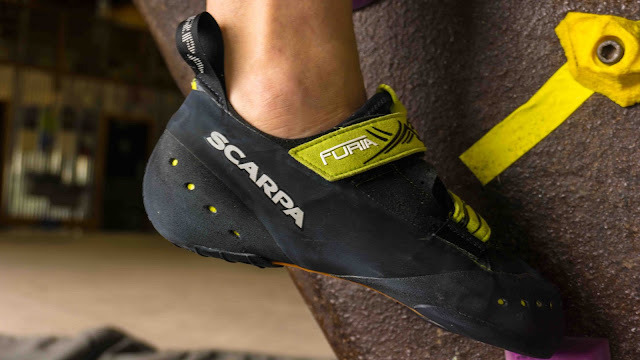 First up, the Scarpa Furia men's climbing shoe. This one's a doozy. Slide it on and it's super lightweight and comfortable right out of the box. How? Scarpa made this one without a midsole. You'll feel that on your first problem, too. Every little nub translates to grip and feeling. Smears become as stable as fist-sized footholds. See that orange stripe on the sole? That's the Power Connection Band portion of the Active Randing construction. To tell you the truth, I'm not sure I knew it was there exactly. I do know that heel hooks and smears were stable as a room full of horses, though. The other thing, this shoe is soft. My everyday shoe is the Scarpa Instinct VS and the Furia is definitely more flexible. You can almost grip down on your feet like you're wearing a glove. The rep said that this translates into a less durable shoe that you might not want to wear every day, but when you really need to send, you reach for this shoe. Well, this pair went with the model in the photo because Outside couldn't afford to pay both of us in dollars (it's ok, he's a friend of mine), so I'll have to ask him about durability later. He's wearing them every day and liking them so far (about five months later). He also wore his last pair of shoes 'til his big toe was poking out. Overall, I give the Scarpa Furia top marks. Most of my climbing is bouldering with a little bit of sport. The fit and comfort of these shoes along with their sensitivity and light weight makes for a premium set of boots. They might not last as long as some other pairs, but if you can afford to have a special set (MSRP $179) these bad boys will get you up there.